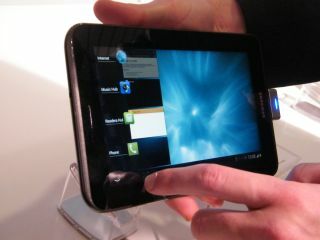 Samsung surprised all this week with the announcement of the Samsung Galaxy Tab 2 at its European Forum in Prague. TechRadar was in attendance and has managed to be one of the first in the world to get its hands on the device. The Samsung Galaxy Tab 2 is a 7-inch tablet from Samsung which is set to come to the UK first and will be packing Ice Cream Sandwich, albeit with a TouchWiz makeover. The tablet is a reboot of the company's first Samsung Galaxy Tab with improved specs but nothing here will knock your socks off. Inside is a 1GHz dual core processor, plus a 3MP camera on the rear of the tablet – and a VGA one on the front for face calling – and when it comes to internal storage there 32GB on board, with the option to add more via the microSD card slot. TechRadar has only had a quick look at the tablet – stay tuned for our Hands on: Samsung Galaxy Tab 2 review – but we were impressed by how zippy the thing was. Looking at the specs, this probably has more to do with Google's more refined 4.0 OS than from the tablet's own power. The screen was bright too – specs-wise it's a decent 1280x600. But don't go expecting an AMOLED display, as the Samsung Galaxy Tab 2 has been given an LCD instead. The Samsung Galaxy Tab 2 UK release date is March with pricing to be confirmed. While we are a little shocked that the Tab 2 was announced before MWC 2012, we have a sneaky suspicion that there will be more size variants coming soon. This was constantly being referred to as the Samsung Galaxy Tab 2 (7.0), so an (8.9) and (10.1) could well be coming soon.